The fallout from the public airing of details surrounding the absence of Renewal SA officials has prompted widespread questions about the efficacy of the secrecy provisions of the ICAC Act, with Lander agreeing a change to the ICAC secrecy provisions “may need to be considered”. But at his highly-anticipated appearance at a parliamentary inquiry today, he argued for greater secrecy – rather than less – suggesting parliamentary privilege should not extend to discussing current ICAC or police investigations. Lander also took aim at the Liberal Government’s new transparency laws allowing open ICAC hearings in maladministration cases, subject to ICAC discretion, arguing that the law is framed such that it only gives the “illusion” of transparency. 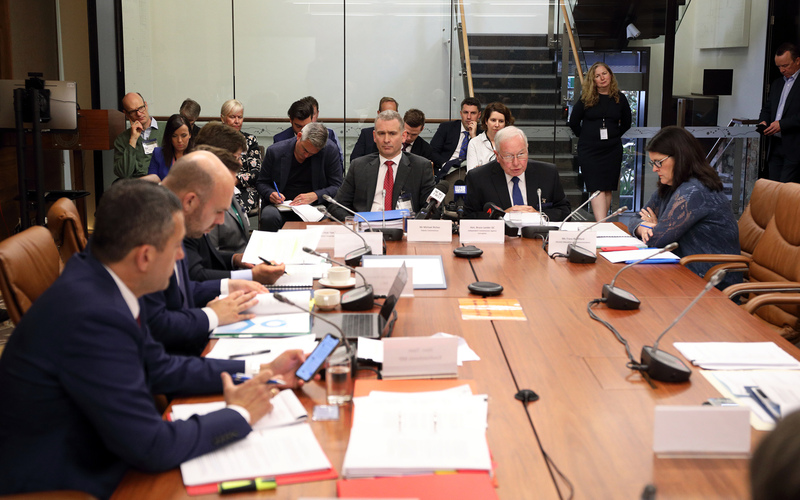 His radical secrecy solution was prompted by Koutsantonis – a member of today’s committee – asking questions in a parliamentary estimates hearing about senior Renewal SA executives taking sudden leave. Media chose not to publish particular questions at the time, prompting the Attorney-General to issue her own statement linking ICAC to the matter – which Lander later revealed was at odds with his own instructions to Chapman. Lander told the committee today Chapman’s statement was “brought to my attention by the deputy [ICAC] commissioner”, after which “authority was given by me to media to print what was said – but not for the Attorney to make it”. “She wasn’t seeking my authority to make a statement,” he added. He said he had not sought to see the Crown Law advice exonerating Chapman of a legal breach, because “it would only be relevant for me if I was investigating it”. He said whether or not his office investigated such a matter would depend on “what else is happening, whether the matter is being investigated by some other agency and whether it needed to be investigated”. He said it was “not for me to answer” whether the matter should be the subject of an independent inquiry. However, he also turned his attention to Koutsantonis’ conduct in estimates, noting “a member of parliament must act responsibly”. “How does a member know what he or she says in parliament will or will not compromise an investigation?” he said. He said he had “thought that political parties had accepted that corruption investigations should be held in private, and that it’s in the public interest to do so”. “Almost all our corruption investigations rely on covert methods of investigation… should the fact of an investigation become known at a critical stage, the investigation may be frustrated and might need to be closed,” he said. He said the “ambiguity ought to be resolved” around the ICAC Act’s secrecy provisions. “Without clarity I fear a future investigation might be compromised,” he said. “It’s time for parliament to consider whether members can use privilege to expose persons under investigation. Lander said Koutsantonis raising ICAC in parliamentary questions “didn’t annoy me [but] I was surprised by it” because “it hadn’t happened in the five years” the Act had been operating. Koutsantonis argued there were unanswered questions about the whereabouts of senior officials, and “if that doesn’t prick the attention of an Opposition, we’re not doing our job”. “Parliament has privileges for a reason, and those privileges are there to keep the executive to account,” he said. Lander argued the need for reform had “been clear since the member made his comments in estimates”. “After that time everyone knew I was investigating Renewal SA… that frustrates the media, who know it but can’t report it [and] it frustrates my office, because we’re accused of being secretive when we’re complying with the Act,” he said. He also railed against reforms currently before parliament, ostensibly seeking to make maladministration proceedings more transparent. “I think this bill might create the illusion of open hearings,” he said, noting he wrote to Chapman “on two occasions” airing his concerns. He told the committee he wanted to make his correspondence public but “she advised she would prefer I did not provide that correspondence so I did not do so”. He said the right for the subjects of such inquiries to appeal them in court will see “lawyers use this to slow down investigations”. “They’ll obtain evidence in advance of the investigations, so as to forewarn their clients… and it will mean in most cases the risk of carrying out an investigation using a public hearing will be too great, because the investigation itself will be frustrated by the appeal process,” he said. But Lander was himself taken to task over last week’s ruling by magistrate David McLeod that evidence gathered from an “illegal” ICAC search warrant would be excluded from a court case against former Transport Department officer Michael William King. McLeod had previously ruled that “the warrants issued by the Commissioner are invalid primarily because they exceeded the power of the Commissioner to issue warrants against private property, but also because they lacked specificity as to the nature of the offence or offences being investigated and the things that were sought to be seized”. “It is the actions of the Commissioner himself that bear the closest scrutiny,” he said in his decision. Koutsantonis noted that McLeod “is saying you didn’t have the power to do this at all”. “I understand that,” Lander answered. He said if the decision is upheld, “the consequence of that will be all warrants issued by me and the Supreme Court are invalid… which will be an extraordinary result”. Koutsantonis countered that “my concern is if the ICAC commissioner has a ruling upheld by the Supreme Court that your office acted unlawfully… your 12 convictions of corruption all come into question”. He said McLeod was “a magistrate, and he’s at the lowest leg of the judicial process”. “Should we wait and see what the Supreme Court says?” he added. “Accept what it says,” Lander answered.